Today's So Shoe Me is the Alexus Open Toe High Heel Booties by Pencey, $316, available at Shopbop. I personally love some morning wood...heels, these intricately knotted leather and wood heels with flirty tassels and dreamy warm colors are perfect for dresses up daytime style. 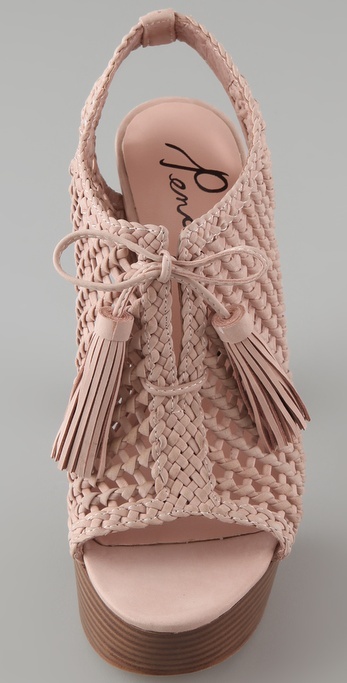 The knotted leather upper adds a special signature accent to the shoe making it sophisticated but not stuffy. Vintage inspiration throughout this shoe would pair well with other 70s trends such as midi skirts and flare jeans. The mix of luxe leather in a knotted daytime finish and warm toned wood heel an platform make this a shoe you can wear all season for a multitude of occasions. Pair this heel with a vintage printed shirt dress that hits the knee for a dressed up daytime look that plays off the vintage notes of these booties. So Shoe Me a pair of neutral leather booties with a vintage inspired towering wood heel and statement making knotted leather upper that is still daytime appropriate.